(CNN) – Planned Parenthood Action Fund unveiled an advertising campaign Wednesday in swing states painting Mitt Romney as the wrong choice for women, a critical voting bloc in the battle for the White House. Backed by $1.4 million, the spot will run on broadcast and cable television in West Palm Beach, Florida, Des Moines, Iowa, northern Virginia and Washington, D.C., according to the political arm of the women's health care organization. 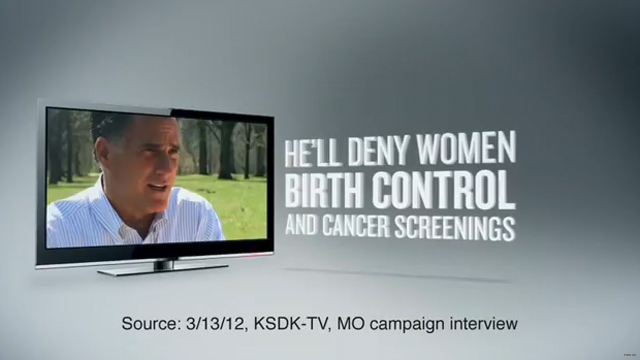 The commercial uses the presumptive GOP nominee's own words and those of campaign officials to accuse him of wanting to deny women birth control, abortions and equal pay. "When Mitt Romney says 'Planned Parenthood, we're going to get rid of that,' Romney is saying he'll deny women the birth control and cancer screenings they depend on," the ad says. "When Romney says 'Do I believe Supreme Court should overturn Roe V. Wade? Yes,' he's saying he'll deny women the right to make their own medical decisions." The first claim came from an interview he conducted in March, in which he cited cutting federal funding to Planned Parenthood as one of the steps he would consider to reduce government spending if elected president. His campaign has said he would support ending federal funding of institution, not the organization itself. Planned Parenthood, which also endorsed President Barack Obama on Wednesday, said the new ad will be the first in a series of spots throughout the general election. "Planned Parenthood Action Fund is committed to ensuring that voters know how wrong Mitt Romney is for women – in his own words," Planned Parenthood Action Fund President Cecile Richards said in a statement. The latest move follows its campaign earlier in the year to reverse a decision to cut funding from the Susan G. Komen for the Cure foundation that sparked a national conversation about contraception, among other women's health issues. Recent polling shows Obama with an edge over Romney among women. Democrats have tried to use Romney's more conservative stances from the primary season to drive a wedge between the former Massachusetts governor and female voters. Team Romney has responded by focusing on economic issues faced by women in the U.S., including job losses they say have disproportionately affected them. It is interesting to see how far right the GOP has moved in regards to Planned Parenthood when one considers that Eisenhower crony Prescott Bush, father to 41 and grandfather to 43, served as the treasurer of the first national capital campaign of Planned Parenthood in 1947. No one aborted us, but we are aborting others "the voice of thy brother's blood crieth unto Me from the ground (Genesis 4: 9). We shall have to answer for all our brothers' blood, as women have become murderers of their children, so we must REPENT. Of course they would attack Romney...this "non-profit" organization with over a BILLION dollars in assets (per their annual report) still wants to collect the over a quarter BILLION dollars they are handed over each year from the government. Another example of waste within the system that if cut out, would save tax payers tens of millions of dollars each year. I'm not saying Planned Parenthood shouldn't exist...what I'm saying is when you have over a BILLION dollars in assets, you don't need to continue to collect over $250million each year from the government. So Planned Parenthood takes taxpayer money and uses it to promote their polical canidate and their political agenda. More great use of taxpayer money from taxpayer who may not approve. Too bad some women will still support and vote for him. I guess they will be happy when they have no rights and their husbands are telling them what to do. Planned parenthood did 332000 abortions in 2009????? Seems like sort of a factory to me???? The rest of this AD is simply just not true-- the mentality of big government is and the ability to control people for their votes by basic spin??? I'm sorry, but Romney can't control the insurance companies. As far as closing Planned Parenthood, it seems like a good idea to me. When my daughter-in-law went to find out if she was pregnant, she just about had to fight her way out of there when she said she was keeping her baby. One baby alive, and one wonderful 15 year old that I wouldn't trade for the world. Lost one Planned Parenthood, and I couldn't be happier. Women will listen to what the candidates say watch what they do. Then they will consider the affect it will have on their health and the health of other women. On this subject they will not vote on party line because women care about each other. This country will not go back to the 40's when women died of cancer do to lack of early diagnosis, in childbirth due to multiple unplanned pregnancies and yes back street abortion. If Planned Parenthood "goes away" exactly where are women supposed to go for these services? And please be specific, don't just say "they can get it somewhere else". Were women allowed to be part of this campaign? Where will their future replacements come from? Will Planned Parenthood be run by guys in the future? Tallk about running off future help. Romney and the GOP will deny women but can't standup to Trump or Limbaugh. "Planned Parenthood Action Fund" – any taxpayer dollars going into that?